Diane France is a member of the Firefighter Assist and Search Team (FAST),which is dedicated to the search and rescue of other firefighter in distress. The team is equipped with emergency self-contained breathing apparatus (SCBAs) specifically designed for unconscious, injured or trapped firefighters. Firefighters who fight structure fires have to deal with an additional challenge this week: the excessive heat wave. Firefighters wear heavy turnout gear that makes it difficult to stay cool. They have to be fully encapsulated with no area of skin exposed to blistering temperatures. Through mutual-aid or agreement with other departments, crews can be rotated to give the firefighters enough water to stay hydrated and rest. This helps keep firefighters maintain productivity during situations when the hard work must continue. Flashover is the sudden involvement of a room or an area in flames from floor to ceiling caused by thermal radiation feedback. This is the energy of the fire being radiated back to the contents of the room from the wall, floor and ceiling. This radiation of energy to the contents of the room will raise all of the contents to their ignition temperatures and suddenly ignite. Self-rescue skills involve incorporating an emergency rappel or following the hose line. Many fire departments use different types of descent devices. Firefighters should be equipped with a Class II Harness, 50 feet of personal escape rope, a descent device and carabiner clips for attachment purposes. After securing a reliable anchor point, the firefighter keeps tension on the rope and makes the way out the window, descending the rope until they’re on the ground. In the event firefighters become disoriented, they can find a hose line and use it to guide their way out. Depending on the direction of travel, firefighters will find either the nozzle on the end of a hose or find egress out of the structure. Some departments have arrows painted on their hoses, with the arrows pointing to the way out of the structure. The first arriving company at a high-rise incident needs to park its vehicle out of the flow of traffic and enter the building with self-contained breathing apparatuses (SCBAs), 200 feet of hose with nozzles, standpipe adaptors and a set of irons. The first-in crew confirms the location of the fire, makes a report to the Incident Commander, uses the stairs to ascend to the fire-floor and begin attack operations. 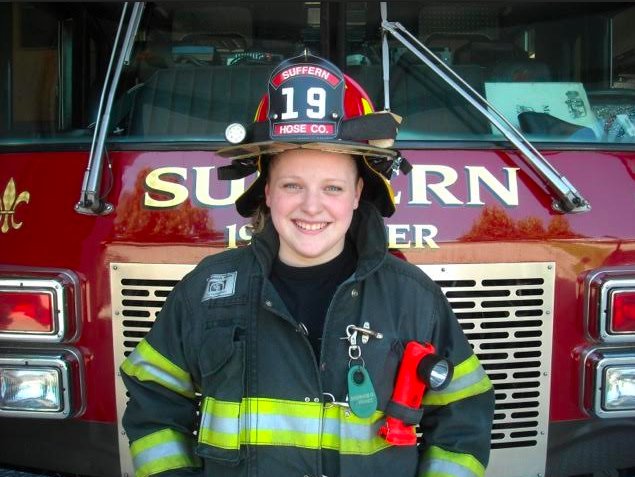 For information about volunteering for Suffern Hose Company #1, call 845-357-8841.